About 9 million women (nationally) are single and have more than $100,000 in investible assets, and the number of them who will want to work with a financial advisor is expected to increase about 60% by 2015, according to Information Asset Partners. 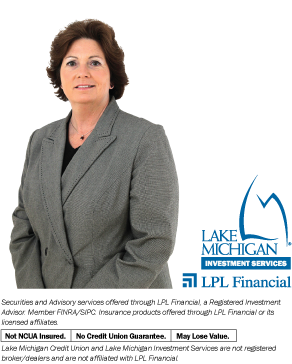 Lake Michigan Investment Services’ Vice President of Investment Services, Kristy Kemnic, welcomes the opportunity to advise women of investment opportunities that make sense for them. "I enjoy helping my clients plan for the future by getting to know them and their needs. I enjoy working with our LMCU team because they work so hard as a unit to take care of members’ complete financial needs." To schedule an appointment, contact Susan Opper at (616) 234-6301 or Ashley Lanting at (616) 234-6358.